There was of course a family precedent to all of this - the Duval family had for many years run a world famous sheep stud and quality vineyards south of Adelaide, coincidentally supplying Shiraz grapes and vine cuttings to Penfolds. 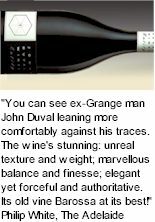 So John Duval was never a newcomer to wine. He was appointed Chief Winemaker at Penfolds in 1986 and was lucky enough to oversee one of the most dynamic periods of change in the Australian wine industry. With the support of a dynamic winemaking team in the Barossa, John secured a number of awards for the company - Winemaker of the Year at the International Wine and Spirit Competition in London in 1989; Red Winemaker of the Year at the International Wine Challenge in London in 1991 and again in 2000; and seeing the 1990 Penfolds Grange named the Wine of the Year by the prestigious US magazine Wine Spectator in 1995. Toward the end of 2002, John retired from Southcorp after a distinguished career of 28 years, including 16 years as Chief Winemaker for Penfolds. 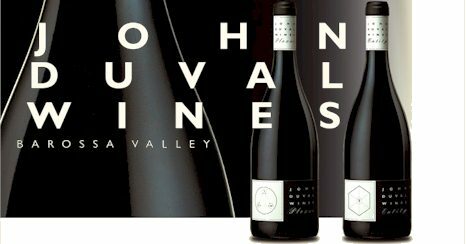 John embarked on the development of his own label in 2003 using old vine Barossa Valley fruit and has created two stunning wines that reflect the terroir of the Barossa and the hand crafted attention of John Duval. Since leaving Penfolds John Duval has consulted to a number of international wine companies in Europe, South America and Australia, including vintner partner in the Long Shadows venture at Washington. The inaugural 2003 Sequel Shiraz was released in late 2005. In Chile John has helped to produce Pangea, highlighting the premium Syrah of the Apalta Valley. In Australia John has consulted to a project using old vine McLaren Vale Shiraz to produce Songlines Shiraz (sold in UK and Australia) and Oriel Sygnet (sold in the US). Today, John rarely gets enough time to spend at home back in the Barossa, but he does insist on securing at least four uninterrupted months around vintage to make his own branded label wines. John clearly loves working with the fruit that comes from the old vines of the region, so he launched his namesake label with 'Plexus', a Rhone style blend of Shiraz, Grenache and Mourvedre, closely followed in 2006 released with his first pure Shiraz, 'Entity'. John also plans to release small quantities of a reserve Shiraz, further highlighting the premium quality fruit from the Barossa. "John Duval Wines will never be another Penfolds - it is simply my chance to express my 30 odd years of premium winemaking knowledge using some of the best fruit in the world. I hope you enjoy the wines."